horses, dogs, cats and other mammals bitten by mosquitoes carrying the virus. do not ingest a sufficient amount of the virus to transfer it to other pets or humans. these periods will decrease the likelihood of infection. mosquitoes from entering your home. 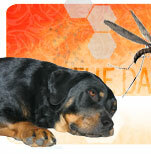 solution provides protection for your dog up to one month after application. Mosquito repellent built into it.